The severe jail sentences handed down by an Alexandria Misdemeanour Court to 21 female Islamist protesters in the Mediterranean city has sparked outrage in Egypt. In a particularly harsh ruling, the court slammed 14 female protesters with 11 years and one month in jail for destruction of private property, attacking security forces and stirring violence, and ordered that seven female minors be placed in a detention centre until they reach the age of majority. The underage girls range from 15 to 17 years. The 21 female protesters were arrested in late October during clashes with residents following a demonstration calling for the reinstatement of ousted Islamist president Mohamed Morsi. Authorities accused the demonstrators of inciting violence, blocking roads and damaging shop facades. Mahmoud Gaber, lawyer for the women, told Ahram Online he has appealed against the ruling, deeming it illegal. He said that according to established procedures, a defendant found guilty on several charges in one judicial case should only face the harshest penalty from among the charges, and not have all the penalties added up. "This is a political ruling," Gaber said. "If misdemeanour courts rule such harsh penalties, what is left for criminal courts?" However, Nasser Amin, the head of the Arab Centre for the Independence of the Judiciary and a member of the National Council for Human Rights, told Ahram Online that some judges believe they can add up penalties when they concern different misdemeanours. Amin said the ruling was "extremely harsh" and should be cancelled immediately. He added that he was sure the appeal would be accepted because "the court will be conscious of the harshness of the verdict." Gamal Eid, the head of ANHRI, wrote on Twitter that, "In the city of Alexandria, the same justice released Wael El-Komi, a defendant accused of killing 37 martyrs, and sentenced 14 girls to 11 years (of jail)." "The state of law welcomes you," he added ironically. Police Major Wael El-Komy, formerly chief of investigations in Raml district in Alexandria, stands accused of being personally responsible for the killing of no less than 37 protesters in Alexandria in a single day, 28 January 2011, during the Egyptian revolution. "Kill and torture and wait for acquittal … Demonstrate with your weak voice and your frail body and power will pursue you," the Strong Egypt Party said in a statement. On his Twitter account, former presidential candidate and Nasserist figure Hamdeen Sabbahi called on "President Adly Mansour to use his powers to pardon the girls." On Thursday, several student unions in different faculties in Alexandria Universitiy resigned over the ruling, according to Egypt's state news agency MENA. They also called on students to go on strike until the 21 female detainees are released. Egypt's April 6 Youth Movement also condemned the ruling. Mohamed Kamal, member of the group's political bureau, said Thursday the verdict was yet another episode showing the empowerment of an oppressive regime that wants to tighten its grip on the country, according to Al-Ahram Arabic news website. Also in reaction to the ruling, the website of the Judges' Club, an independent and influential representative body, was targeted by an anonymous hacker, calling himself Pharaoh and distancing himself from the Muslim Brotherhood. "I never thought that one day I would defend a Brotherhood member," the hacker wrote on the website, with a picture of the culprits in the court dock. "But today … I will defend 14 girls condemned to 11 years of jail," he added. "Despite my hatred for the Brotherhood, this is injustice." The website was later shut down for maintenance. The Alexandria ruling is being seen as part of the wide crackdown led by Egyptian authorities against Islamists since Morsi's ouster. More than 2,000 Muslim Brotherhood members have been detained on charges of inciting violence, including the group's top leaders. Earlier in November, a court sentenced 12 university students to 17 years in prison over riots at Al-Azhar Institution, also stiring criticism over the harshness of the sentence. The students were found guilty of attempting to storm the headquarters of the institution, inciting riots and attacking Al-Azhar employees and security personnel, as well as sabotaging public and private property. They were ordered to pay a fine of LE64,000 each. Muslim Brotherhood supporters have been staging near daily protests calling for the reinstatement of Morsi who was deposed by the military 3 July amid mass protests against his rule. Pro-Morsi protests chanting against the military have often descended into clashes with security forces and local residents with anti-Brotherhood sentiments. Even Hitler and Musolini didn't send kids to prison for protests. These people are fascists of worst kind. Let us not lose sight of justice. There is a sharp contrast in the judges attitude towards Mubarak and his loyalists when compared how with those who are anti coup Egyptians. 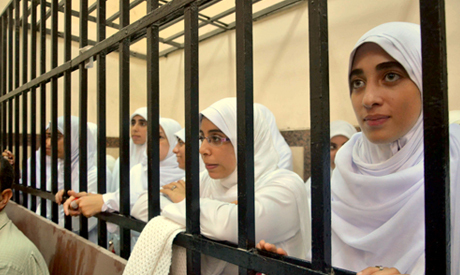 The severe sentences meted by the judges on the young Egyptian women reflected that the judges were trying to please the illegal regime. The judges in Egypt have failed to proceed against Mubarak and his loyalists. But, look at the speed of their actions and the severity of punishments when it involved anti coup politicians. These are all " manifestations of judges' mental state which are not free to dispense justice ". The people in authority in Egypt today is living on the blood of their fellow Egyptians. If they have no shame or feeling of guilt, they should fear their creators. Yes,Egyptains Pharoahs vanished from the world but their offsprings still exist in Egypt,some joined Egypt Army & police while rest you can see here appreciating and feel proud on the crims of their siblings against poor egyptians. very well said and I have nothing to add. Exactly how I think. Thanks Samantha, good to know I'm not alone with this opinion. Do not be deceived by their appearance. They are devils promoting evil doings. Egypt is moving from Dark Age to dawn of civilization. I also think the sentences are far too harsh. A few months, max. one year, would fully do. Perhaps Egyptian courts should consider sentencing culprits who commit violence and destroy public or private property (and that is what these innocent-looking young ladies did!) to a certain amount of community work, giving them a chance to compensate for the damage they caused.